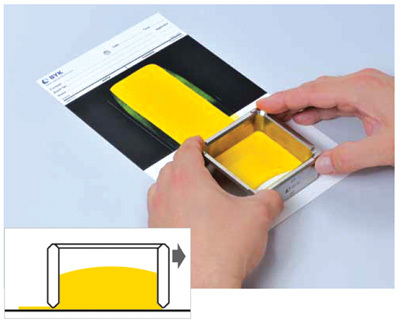 Available in three film widths, 2", 3" and 4"
A small quantity (depending on length and thickness of film required) of the material to be checked is placed on the inside of the channel near the correct opening for the thickness desired. The applicator is then drawn down over the chart or other surface and a uniform thickness of film is produced for observation and test. A path with a depth or a clearance of one mil will lay down a film approximately 1/2 mil thick. A latex film will shrink considerably more, so paths of greater depths are required in order to obtain a dry film thick enough to check flexibility and toughness. For certified gages add /C and add $376.00 to the price of gage.